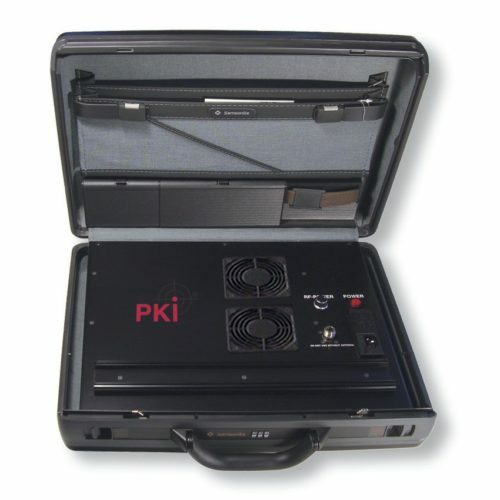 Our PKI 6120 Cellular Phone Jammer represents an excellent and powerful jamming solution for larger locations, such as prison buildings, law-courts and banks or government and military areas where usually a high level of cellular base station signals is emitted. Due to the high total output power, this device can cover all such areas with a RF-output control of 10, 20, 30, 40 W with digital display. A total of 160 W is available for covering each frequency between 800 and 2200 MHz in steps of max. 40 W for each single frequency band. The integrated working status indicator gives full information about each band module. Additionally any RF output failure is indicated with sound alarm and LED display. Total output power: 160 W, at each a.m. frequency band with 40 Watts max.